Pops506th wrote: ...... Here is a pic of the BUDD number. It's a little tough to read the last digit. Hello Pops..... here's what I can tell you about that BUDD number 68991. - If delivered to the Army, it would have had a hood number in the region of 2R 2xxx. It is definitely NOT a 1962 vehicle .....but it's a very nice one. I'd be interested in seeing what the details are on the dash dataplate....can you post a picture of that, please? Here's a pic of the dataplate. I suspect that there was some dataplate swapping happening in the motorpool at some point in time to fix the unit's property book. Last edited by Pops506th on April 13th, 2018, 1:56 pm, edited 1 time in total. It was probably done in a motorpool or shop at some point in it's military career. 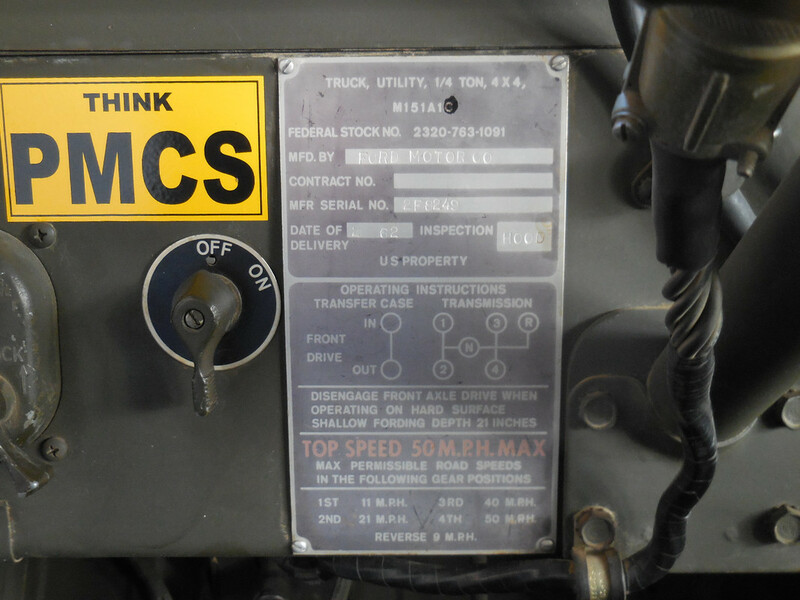 I suspect that the 151A1C was what blank dataplate the PFC was given when he was told to stamp it and put it on the MUTT. They did not change the data plates in service, That is akin to changing a VIN tag on a civilian car. Big time NO-NO. That does not mean it didn't happen, but it wasn't done in the motorpool for sure. AND, No contract number, So you can be pretty sure it was not done in service. Thanks for the info. I figured that it wasn't what was on the data plate. Don't worry about that data plate, we have seen many here with wrong plate. It would be nice if it was the original one, but that's what's on the title, so that's what's gotta be on the plate. I'm really appreciating all the info I'm getting from you folks here. I can't get any real history of the civilian history of this vehicle as the previous owner passed away and I have no way to contact the owner before that. I'm not sure if he's still around either. There is a blank 151A1 data plate that came with the vehicle, I will most likely stamp that one with the correct contract number but will need to keep the 62 date and serial number to keep it matching with the title. There are a couple of guys out there who can stamp the plates in the original styles so that they look just like the originals. That's because you are a youngster still, wait till you get old like the rest of us know it alls. Who is doing correct stamping? MV Data plates has been unresponsive. MV dataplates folded a few years ago as far as I know. He did some rather shady deals that fell through from what I hear. I do know for a fact that a lot of people sent money and never received products a few years ago. There are a couple of guys doing plates, one works out of a repurposed trailer. I can never remember names but someone on here should know who they are. They travel the show circuit. Hambone wrote: That is a great looking A1, you don't find them in that shape anymore, the second pic reminds me of the tv commercial with the dogs driving, I don't think it's a 62 model, you can run the numbers with Ken(muttguru), he can date it for you. Ken (muttguru) verified the year of this A1 last year. This is a very solid example of a 1967 M151A1. I had the opportunity to view this Mutt when the owner belonged to the Northern Recon Group http://www.northernrecongroup.org. The brake cylinders were replaced with NOS parts from FLMV.net. It could stop like it had power brakes. The seat cushions are from Surplus City Jeep Parts in Oroville California. This Mutt had all original Vietnam era tires, 1966-69 dated tires, before they were replaced. Nice to see it went to a good home!